Being the proud owner of a copy of the original Majors-only version of the Gaian Tarot printed in 2004, and having followed the gestation, creation and journey of the deck to its final manifestation as a 78-card deck printed by Llewellyn, I am thoroughly enthused by this deck. There’s nothing quite like watching something in its creative process reach its completion, and Joanna Powell Colbert brought so many people into the process of the Gaian’s creation that it already feels like a familiar and well-loved friend, and a deck that has been driven by the desire and energy of the Tarot community as much as the artist. There are many decks that can be described as beautiful, but most of them are beautiful simply by virtue of the artwork. The Gaian Tarot is beautiful not only because of its evocative images, but because of the soul that shines out from each one. If it were a person, the Gaian Tarot would be “beautiful inside as well as out.” The artwork is indeed stunning, but this deck isn’t just a pretty face. The Gaian Tarot does not overload the reader with occult symbolism; rather its meaning is evoked with images of everyday life, specifically the everyday lives and activities of the community of Lummi Island upon which the artist lives. Joanna states in her introduction that the island community, “both human and non-human”, is the “matrix from which this deck emerged.” What this means for the reader is that the Gaian Tarot has something real about it, with each card offering something we can relate to. The traditional archetypes of the Tarot are brought down to earth and placed into a nature-oriented, community-based perspective that is far easier to read and understand that the otherwise out-of-context medieval images and concepts. So the Emperor (actually titled The Builder in the original deck and in the book, but titled as the Emperor on the cards, possibly a Llewellyn misprint) is no longer an imperial ruler in plate armour holding a sceptre, but instead a man putting the finishing touches to the carving on the pillar of a house that he has finished building, outside which are stacked the logs ready to feed the hearth fire. The Chariot is renamed the Canoe, in which a half-naked man with clear focus and strength of arm and will steers his canoe across a lake at great speed, accompanied by fish and orca whales, one man steering the course of his direction and destiny. Many of the Major Arcana have been renamed to better fit the deck’s nature-focused and spiritual/community perspective. The Empress has become the Gardener (I like to note that the Empress and Emperor, therefore, are given non-gendered titles, highlighting the fact that they can easily relate to both men and women), the Devil is now Bindweed, removing the overbearing figure of Chistian fear and replacing it with nature’s own chains (that any gardener will know is as difficult to remove and control as the addictions and fears of this card, equally as intrusive, and can grow anywhere). The Hierophant is now the Teacher, so the traditional sombre Pope is now an approachable wisdom giver seated at the roots of an ancient tree, the Tower is now Lightning (the lightning of both destruction and inspiration), the Fool the Seeker, and the Hanged Man The Tree. Personally I love the change of Judgement to Awakening, in which people of all ages and shapes, in silhouette, rise free with joined hands to greet the dawn, above the sacred burial chamber of Newgrange that is both womb and tomb. A lily rests on the bottom of the card reminding us that this beautiful flower grows from the mud beneath water. Of particular interest to me is the change of the World to “Gaia, the World”. Since the deck is named after Gaia, the earth goddess of Greek mythology and the name that has been adopted by many environmentalists and global community theorists and activists, this change is very important for the deck. 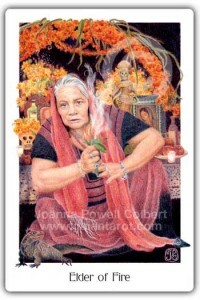 In this card we see a white-haired, smiling woman holding the globe in her arms with the sun behind her, while multi-coloured prayer flags fly in the distance. This woman is Grandmother of All, and as members of the global community of Gaia, her daughter, we are her grandchildren. This makes us all linked, along with all other beings on the planet. This World card puts us in the position of benefactors of the earth’s resources as well as participants in its cycles: we are not separate from nature. In theme with the natural focus of the deck, the Gaian’s Minors are not given their traditional elemental weapons of Cups, Coins, Wands and Swords, but instead are simply named after the four elements (with the suit of Swords being Air and Wands being Fire). These cards feature strong animal and nature imagery, as well as cards depicting human interaction on a social, individual, and spiritual level. In short, they are a complete snapshot of life on all its levels, as well as a blueprint of hope for an environmentally aware, spiritual community that is achievable by everybody. The images are at once deeply symbolic without the need for the occult bumph that sometimes overloads other decks, and simple so that they speak to everybody. The squirrel busy gathering and storing nuts surrounded by an Autumnal forest on the Four of Earth (Coins) clearly speaks of storing up, saving for a rainy day, survival skills and the gathering of resources for a protective and defensive purpose. The playful otters splashing and frolicking in the clear, sparkling water of a river illustrate the carefree, social, celebratory nature of the Three of Water (Cups), and the four blue bird eggs in a nest surrounded be twigs and branches in the Four of Air (Swords) are more evocative of rest, the pause of thought before the fullness of manifestation, peace and retreat than the traditional Rider Waite image. The human interaction shown on the Minors is also beautiful, uplifting and familiar, even for those of us not lucky enough to live in such a beautiful place and community. The Six of Fire shows a group of people gathered around an outdoor campfire, playing drums and dancing. The focus is on the woman dressed in red, whose body moves to the beat of the drums and dances out the movements of power, success and achievement. Together the community celebrates victory, or the turning seasons, or a rite of passage; alone the woman is secure in the triumph of her own body. 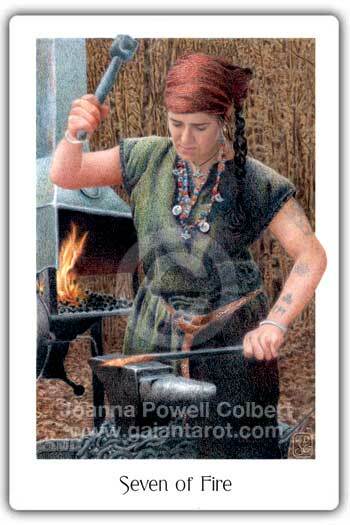 The Seven of Fire, instead of showing a staff-wielding man standing against other staffs in defense, shows a woman blacksmith at work, her own strength being put into the hard task of hammering hot metal into shape. Are we the blacksmith, or the metal? Do we exert the strength and pressure, or do we undergo the beatings of the world to become shaped in the forge? In the Eight of Earth we find a simple image of a daughter learning to drum from her father, teacher to student, the passing down of knowledge and wisdom and learning through practice and application. adhere to traditional gender stereotypes, and the titles have been changed to reflect this, expressing the nature of each Court far more succinctly. Page has become Child, Knight has become Explorer, Queen has become Guardian and King has become Elder. All the Children express the youthful new beginnings and burgeoning awareness of something new to learn, and feature children upon the cards. All the Explorers are young people in their twenties or thirties, that time of life when we are on a quest to discover our calling, our destiny, our passion and our selves. All the Guardians are mature people in their midlife, who are often in the role of protectors, nurturing a family, a career, home, or community; and all the Elders are in their seventies or older, with all the wisdom and security of self that their years bring, and the peace and strength that comes from knowing and understanding. But not for the Gaian are the stoic, staid men holding discs and swords or knights holding cups on horses: instead, we find colourful characters, their activities and facial expressions clearly evoking the card meaning. The Elder of Water (King of Cups) speaks to me strongly, being an older man (he looks like an old sea dog) rowing out across a lake at sunset, his head tilted as if listening to the peaceful sound of his oars in the water. I think he is going out to the water to return to a sense of peace and wholeness that he always felt as a young man at sea, or out fishing, and it is his knowledge of where he has come from and who he is that not only gives him emotional fulfilment, but also comforts and counsels others. The gaze of the Guardian of Air is piercing and analysing and she brooks no argument as she coldly assesses the reader; and the Elder of Fire sits before an ofrenda for the Mexican Day of the Dead with Santa Muerte in the background, burning sage as an offering and her eyes seeing both this world and the next, her secrets ones of magic and mystery and the fire that burns in every soul. 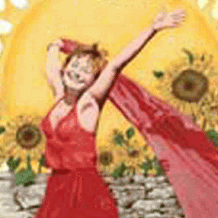 There are also some moments of “Aha!” when looking through the Gaian Tarot, in which Joanna’s representation of the cards gives you an entirely new (and better!) perspective on a certain card. This is particularly true in the case of the Minors, which are often deeper in meaning, consideration and scope than the traditional divinatory meanings. This makes the Gaian Tarot not just a divination tool, but a deck to reflect your soul and all its workings, a deck to use for guidance and inspiration, and a deck for aligning oneself with the flow of the universe around you. It’s great for beginners simply because the card images are so approachable, beautiful, and filled with meaning without being overloaded or overcrowded; it is simple yet complex at the same time. It’s also a deck that I would recommend to anybody experienced with Tarot, as it had the effect of adding significantly to my understanding of the cards and the role Tarot can play in one’s life. 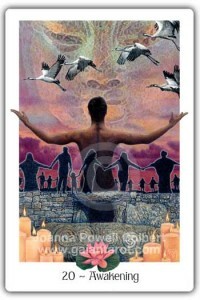 The Gaian Tarot is one of those decks that speaks to the inner core of a person, and whilst some Tarot purists may say that Joanna has “fluffied up” the darker cards (such as the Ten of Air), I would say that instead she has deepened their otherwise shallow meanings to promote a proactive approach to life and Tarot reading. The Gaian Tarot is accompanied by a 269-page book, “Journey through the Gaian Tarot”, written by the artist. This book is truly insightful when it comes to examining the symbolism in the cards, and discovering the unique, deep perspective of the Gaian Tarot. It is geared towards helping a reader study the cards themselves, with journaling questions suggested for each Major Arcana, and affirmations for the Minor Arcana and Court Cards. The reversed meanings of each card are called the “Shadow side” of the card, which is a more evocative term than “reversed” and makes reversals easier to use for beginners. Handily, the Minors and Courts are also organized by number and title, e.g. all the Twos together, all the Explorers together, so that the similarities between them are highlighted. The book concludes with several useful spreads for a wide variety of situations. Check out Joanna’s website here.